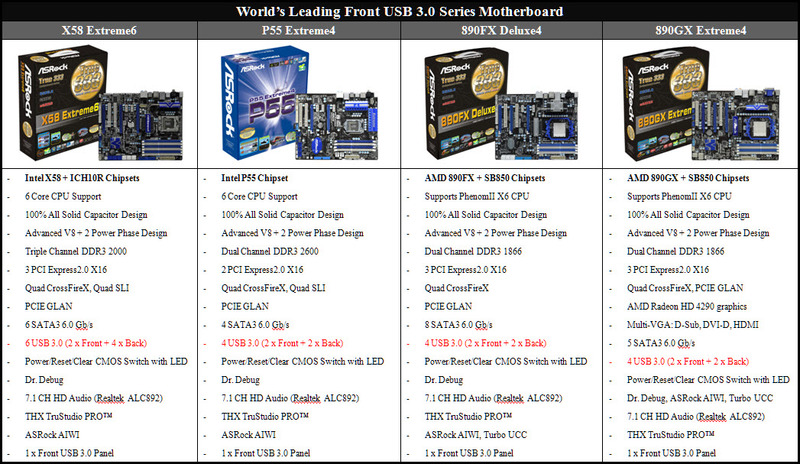 ASRock reveals New Motherboards Lineup featuring USB 3.0 and free USB 3.0 Front panel. ASRock has revealed its new motherboards line up featuring the new USB 3.0 and a good news is that all the boards will come with a free USB 3.0 panel along side the I/O Panel which will further provide two more USB 3.0 connectors on your front panel. The USB 3.0 front panel not only aims to provide faster data transfer speeds but also ease of use without the need to plug the USB to the scattered back of your PC. Specs wise all the moterboards seem real impressive and 6 core cpu support option and other overclocking features make them a great buy for PC Hardware Enthusiasts.